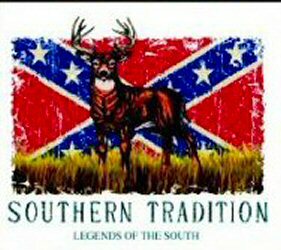 Rebel Yell clothing has selected items that are very popular with some of the locals who enjoy redneck or Confederate Rebel Flag T-Shirts, Confederate Rebel Battle Flag Bikinis, Texas Flag Bikinis or Beach Towels. 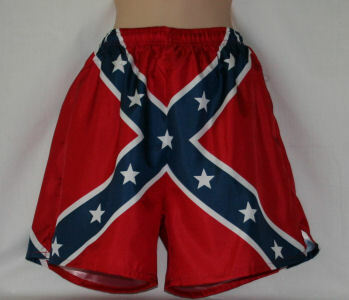 Check out the newest thing for gorgeous Southern girls, the Rebel Flag Lycra HOT SHORTS! These shorts are hot, hot, hot and all the girls at the Redneck Games in Dublin, Georgia were wearing them! You can wear them with your bikini top as an extra swimsuit, or with another top. For some select leather clothing, please visit our Confederate Rebel Leather product page. We wanted to bring you the t-shirts we like best. They are short sleeved, heavy white cotton, with shoulder to shoulder tape. They are printed on the back and have a crest on the front. Girls and women can wear some of these Southern t-shirts also. Daisy Dukes herself would be jealous and want a pair of these. They come in stretchy DuPont Lycra, fit like a glove, and you can wear them with your bikini top or another top; as a swimsuit bottom or shorts. The latest and the greatest! Draw string front. $24.95 each - No Returns. **Note: 1X will normally fit large also. They are not made to be tight.